I had a horrible realization this weekend. I am in the nesting stage of pregnancy, but I don’t like to clean, nor to organize. When it gets down to it, I (ironically) am not a huge fan of home projects. But I love me some food! I wonder if my version of nesting is to cook. Have any of you mamas had this version of the nesting bug? Is it a thing? The fact that the fridge is currently weighed down with leftover apple cobbler, chicken sausage, feta and spinach egg casserole, baked potato soup, and butternut squash lasagna support this observation. 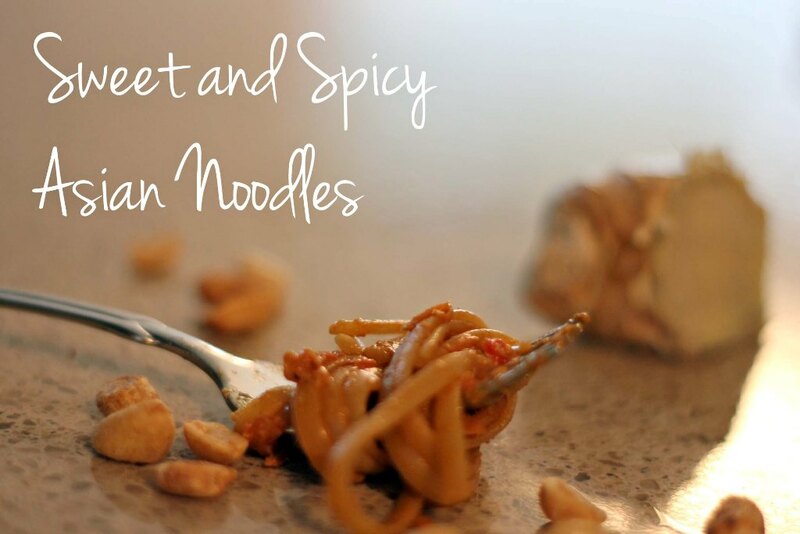 All of that said… whether of not you find yourself enjoying your time in the kitchen, with or without kids to feed or the energy to produce another weeknight meal, this Asian noodle dish is one for your arsenal. I found the original recipe in SELF magazine earlier this year. They suggest it’s a good option for an outdoor picnic, which I don’t doubt in the slightest. Unfortunately, our weather has only let me test the “it works great slurped up from a bowl, while sitting on a couch covered in a biggilion blankets” location, to which it also wins awards. This dish doesn’t make a ton, making it great for a home alone night. Double up for big family (and/or lunch leftovers) and triple as a good party side dish. 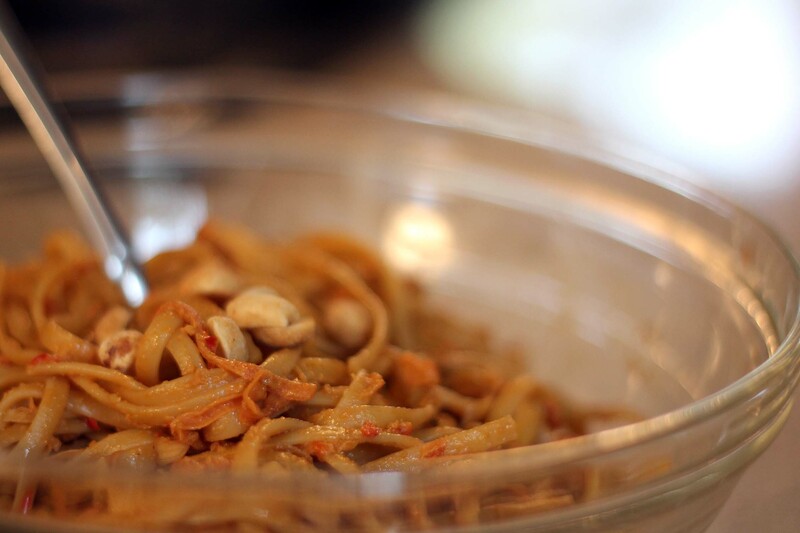 With a tablespoon or two of water, these noodles make great leftovers! This easy sweet and spicy Asian noodle dish will be your new go-to weeknight staple. Add in whatever is hanging out in the fridge to make a perfect dish! *Use any stir-fry vegetables you like! 1. 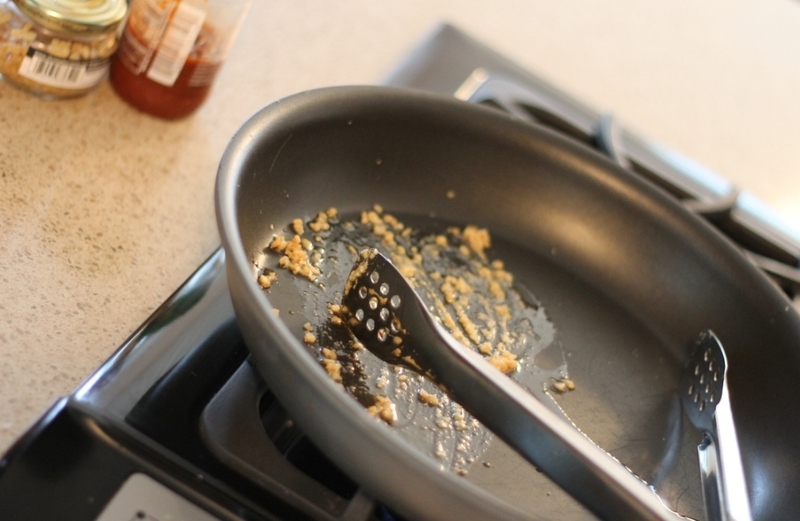 In a medium frying pan, heat oil over medium heat. Add garlic and ginger and stir until lightly browned, about 1 minute. 2. Add vegetables to the pan. Stir and cook until soft, about 4 minutes. 3. In a small bowl, mix 6 tablespoons of water, peanut butter, soy sauce, hoisin sauce, sugar, rice vinegar and chile paste. Pour into frying pan, stirring often. Heat until sauce thickens up, roughly 4 minutes. 4. Add drained linguine and optional cooked meat to the pan. Toss together and pour into serving bowl. Top with green onions and peanuts. Serve hot, cold, or at room temperature. Made this recipe tonight and found it to be very pasty. The flavor was nothing to get excited about. I will continue looking for a good asian noodle recipe. Others who want to give this a whirl, add water until the sauce reaches a consistency you like. Also, try to warm slowly. Patience is key for this one.